The list of things I love about summer is miles long; lighter layers, showing off bright pedicures, wearing tons of white, not spending time with the straightener and throwing my hair up in a bun, day trips, beach trips, sunsets after 8pm... just to name a few. Recently, Dressbarn sent me a lovely package of some of their summer essentials. A neutral crossbody bag that converts to a clutch or wristlet (I love being able to shop hands free), aviator sunglasses (never leave the house without a pair), and a statement necklace (can't seem to get enough of them). All of these accessories were under $30, and even better is the wide array of adorable dresses Dressbarn is currently carrying. Most are under $50 at full price, like this pineapple print dress (I know, I need to stop) and on sale, this cute striped sheath dress is only $25! What are some of your summer style essentials? What a perfect casual look! Loving that skirt!! You look great. =) I actually own a similar leaf skirt from The Limited. I should try this outfit you wore with my Denim Jacket which I finally wore for the second time this Summer (yesterday's post). 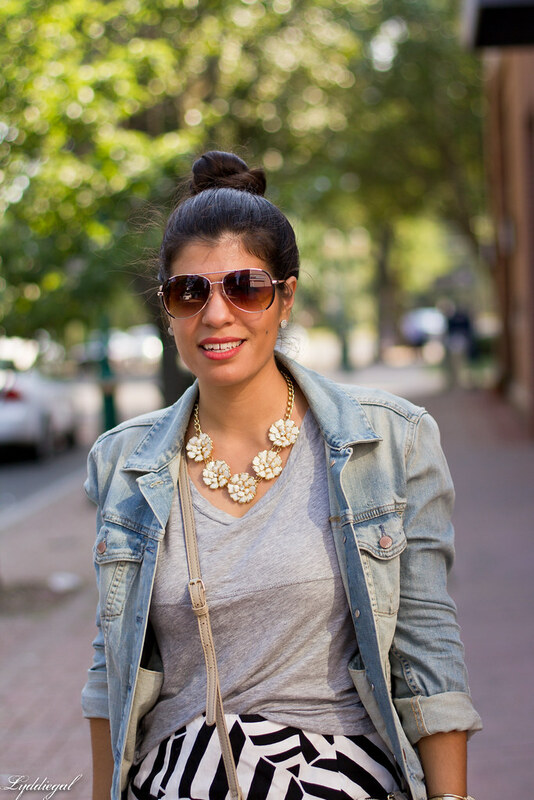 I too love Light layers but it is hard layering in general for Summer here, because our Summers are usually very hot. Absolutely love this look-you styled it to perfection!! I don't understand we can't always have long days! I am so much more productive, in better moods, eat better! Everything! I absolutely love your combination of bracelets in this post. And coupled with the thin gold ring? Love love love. Cross body bags are a summer essential for me too! No doubt summer rules in my book too! And I never thought much of Dressbarn, but one of my bridesmaids got her dress there and it was SO PRETTY!!! This skirt is just amazing, I LOVE the pattern and how you keep the rest of your outfit simple to make it the focus! What a cool skirt! I love anything with a graphic black and white pattern. I love how you styled it too! I'm loving that printed skirt and you look fabulous in this outfit. 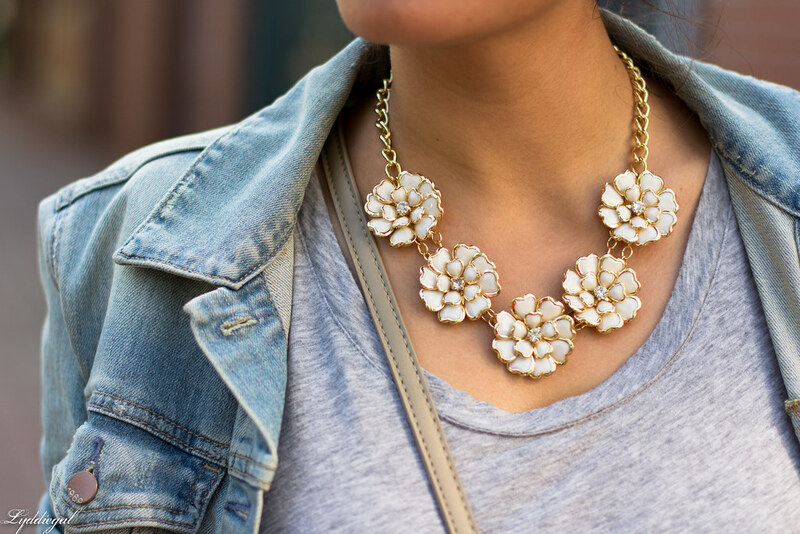 So fun and easy, effortlessly chic. You look so casual and chic! I love that skirt! The print is fabulous! Love the casual sophisticated look! So pretty. Oh wow awesome ensemble Lyddie....love the mix of denim with the B&W skirt!! BTW...I'm already following you at Twitter, hope to see you there too!!! Cute look! That skirt is adorable! And I love that the bag is convertible. That's so convenient! Gorgeous ensemble, that skirt is so pretty. Lovely look, Olivia! You know how much I love your hair and this is a brilliant styling option! You look so fab! Low-maintenance hair and cross-body bags are my summer musts as well. And speaking of bright nails, I love the white mani! What cute pieces! I love petite crossbody bags, especially in neutral shades like this one. To me they always look so elegant and well, indicative of someone who has it all together. I carry mine as often as I can, but usually I'm more concerned about being able to fit my spare flats into my purse in case of emergencies which means a bigger bag :) But for a crossbody bag this cute, I could be persuaded! Oh, and your skirt... It's probably a good thing we don't live closer together because I can guarantee that if I could, I would be stealing it from you. Great skirt - and i am glad you're enjoying your summer. This is not how I remember dress barn, some really cute pieces here! Perfectly cool for summer! Love it! I really love this outfit! I've never really given much thought to Dressbarn but I might have to give them a shot! I LOVE that the days are so much longer, sunlight is so good for us! I really like this skirt, it's such a great print! That skirt is incredible and I love that you paired it with a gray tee. You look amazing. I love that fantastic optical print skirt! 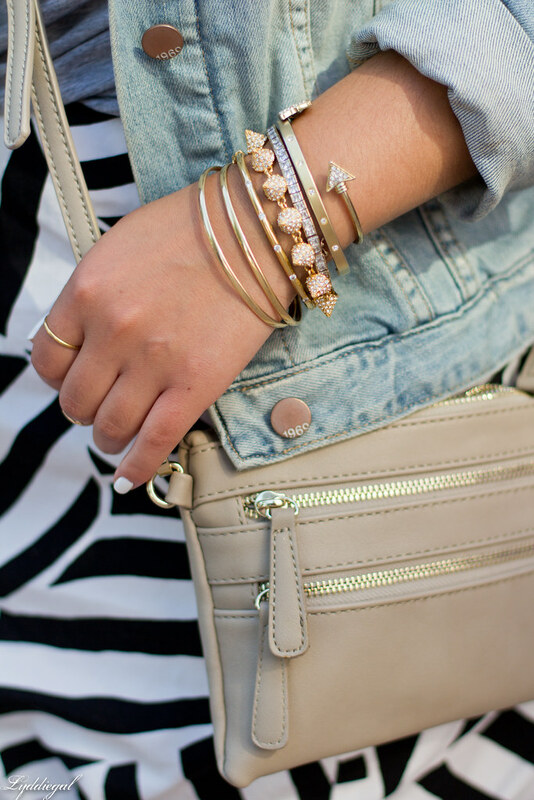 I love everything about this--the fun accessories, the denim jacket, the funky skirt. Love! Love this skirt on you. 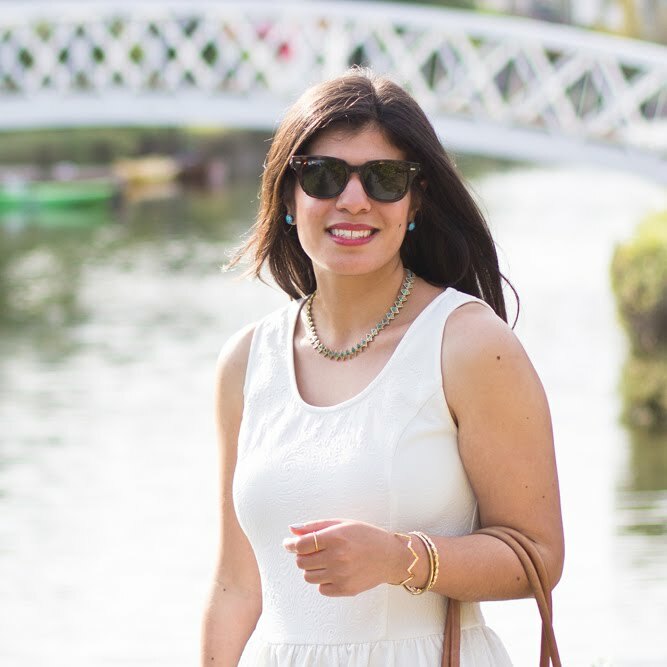 My summer essentials are sunscreen, sunglasses & breathable clothes. Lydia, I'm in love with your accessories!! Such a cute skirt, and I really love that denim jacket! Definite summer staples! Love the black and white skirt. I have enjoyed dressing for summer more this year than ever. Usually I am a total fall girl. Love this outfit, so pretty! Lovely look all around. The pattern on that skirt is great. Like your necklace and bag too. Some really good essentials. Super sharp outfit Lydia! 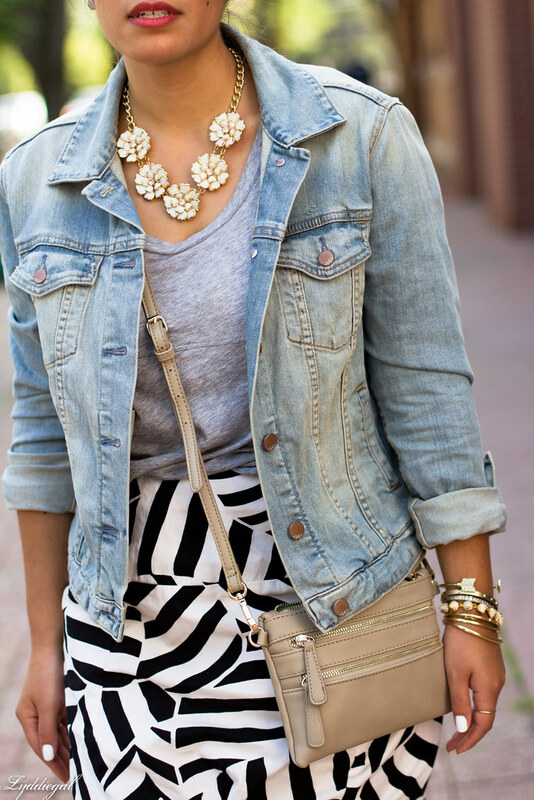 Gorgeous skirt, necklace and denim jacket. Love that bag! Very nice of them. Superb styling. love love love that necklace!!!! I really like that bag. What I can't believe is that those are all dress barn! These retailers are definitely stepping up their game lately!